Today's re-post comes from another blog called "Here's Your Gold Watch". The author, Anet suffers from Rheumatoid Arthritis and in this post talks about the benefits of being engrossed in a good fairy tale during episodes when pain is troublesome. I have a lot of things that bring me comfort and distraction in my life with chronic illness. The first one would be getting lost in a good book. Now when I do get sick it hits me harder and there is nothing more helpful than a really gripping book. Thinking back to childhood here's the shelf in the library that I gravitated toward. I think that I have read all of these. 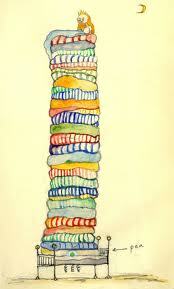 Fairy tales have coloured my view of what is the ideal comfort, and who can forget The Princess and the Pea. Though she slept on a huge pile a featherbeds she could still feel that irritating pea under her mattress. I got a feather bed a few years ago and I don't believe she could have felt the pea. A featherbed is very cosy and comfortable. You can put it on top of your regular mattress. It gets a big AAAH from me. 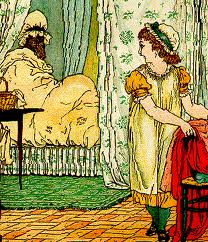 When I think of Little Red Riding Hood the first thing I see in my mind is the wolf, snuggled into Granny's bed with her sleeping cap on. And I am sure the wolf is snuggled under a duvet. 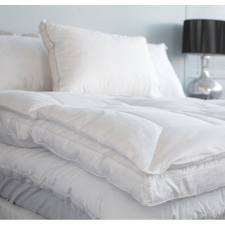 There is nothing warmer and lighter to sleep under than a goose down duvet. I have taken some advice I read once to use the duvet alone without a top sheet. That makes it easy to shift at night and the bed is made with a shake in the morning. Sleep is vitally important in chronic disease. That's why I am so fixated on maximum comfort and minimum irritation. 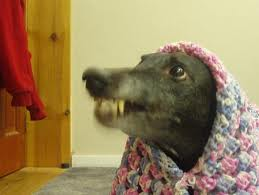 This fits into Little Red Riding Hood again and here we have the loyal pet dressed as the wolf and pretending to be "Granny, Oh what big teeth you have". A pet is the source of so much comfort and fun for people. Time and again I read of the devotion and strong connection between pets and people and it is very healthy, often lifesaving. And a lot of fun. 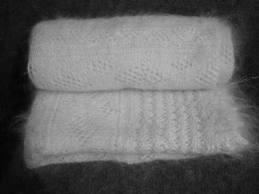 Cashmere shawl (worn by the good witches). I can't find a fairy tale to match this choice but I am convinced that good witches are not only good but fluffy. Nothing can match the luxurious feel of a soft shawl or wrap. And now my final (and most scary comfort). 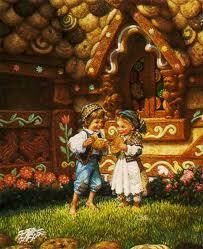 What symbolizes comfort food better than the witches house in Hansel and Gretel that is made of candy and sweets. So tempting and I don't even have the excuse of being an undernourished small child. Fairy tales always have a dark and frightening side and so does the reason I am so attached to my comforts. Chronic illness is a real burden, and unfortunately you never get to retire or toss it aside. Giving treats to the body and soul makes it easier to cope and gives us something to look forward to. Small pleasures are one of the joys of life.